Governor-elect Ron DeSantis, who will become the youngest state governor in the United States on Tuesday, will be rather busy his first week in office. Once becoming Florida's 46th governor on January 8, DeSantis plans to appoint a new justice to the state's Supreme Court, announce his plans for the environment, and begin suspending various appointed local officials. During a press conference Monday afternoon, one reporter asked the governor-elect if, among his first executive actions as governor, he would suspend and replace controversial law enforcement official Broward County Sheriff Scott Israel. Israel faced public backlash for his lack of leadership and competency in handling the mass shooting at Marjory Stoneman Douglas High School in Parkland, Fla. last year. Though DeSantis didn't say it outright, Sheriff Scott Israel's days as Broward County Sheriff appear to be numbered. 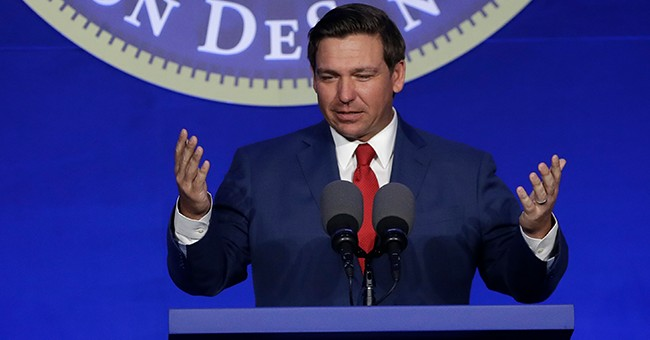 "There will be executive actions on potentially a number of local officials within a relatively short time of taking office," DeSantis said. "As you know, if you're going to suspend somebody, that's kind of one step. The other step is, you have to appoint a replacement as well." The governor-elect noted that any decision to remove the sheriff wouldn't be a political calculation and stated his goal is to "get somebody in there who's going to do a good job." As for the suspension of other officials, "I think you may be surprised at some of the fronts that we're looking at right now in that respect," DeSantis concluded. Watch Governor-elect DeSantis' response below.